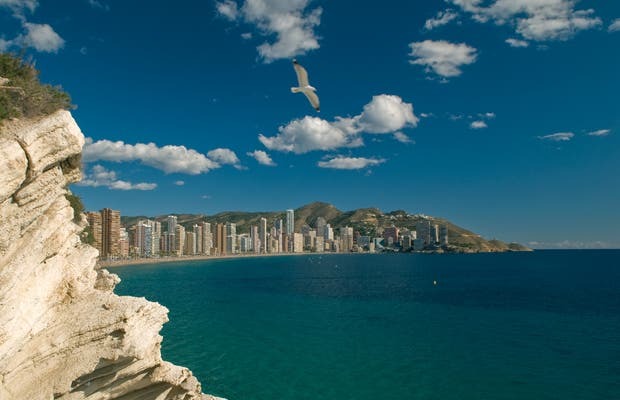 Levante beach is 3 km long and the center of activity in Benidorm, ideal for spending a day on the beach without any worries. It starts at Loix and ends at the Mirador (viewpoint). Poniente beach is 4 km long and is an extension of gold-colored sand. Thanks to their southern orientation, the two beaches remain clean. Year after year, they receive the prestigious Blue Flag from the European Union for the quality of services offered and the quality of the water. Poniente beach now has a boardwalk and several nice lookout points. It starts in Elche and ends at Tossal’s Virgin of the Sea Hermitage. This is an incredible beach of white sand and clear water in the shade of palm trees, all under the wonderful Costa Blanca sun. It’s like paradise! Outside of the crowded and party-hardy beaches in Alicante, there are some that are really spectacular and beautiful. Fortunate are those who can enjoy those scenes everyday and stroll, swim, and jog along those amazing beaches. One of the most typical sights at Benidorm’s beach are the sand sculptures crafted by street artists. They are generally created at the end of Levante Beach, where the boardwalk starts. They truly are amazing. It’s incredible they can make these magnificent sculptures, rich in design and detail from sand, they’re true works of art. The themes always vary. For example, I saw a representation of the last supper.